This is an exciting time for the City of Charleston, the staff of the Charleston Coliseum and Convention Center and all of our clients. We broke ground on a $100-million expansion and renovation project in June 2015 and completed construction in October 2018. This project could not have been possible without the vision of Mayor Danny Jones and City Council, our ability to create a source of funding through the home rule program of the WV Legislature, a dedicated group of volunteers from the Civic Center Auditorium Board of Directors, the competence of City Manager David Molgaard and his associates, and the perseverance of the loyal and dedicated employees of the Center. A great team delivering the best for Charleston. The Civic Center was first opened in 1958. It was expanded in 1965, the coliseum was added in 1980, and expanded again in 2000. The facility is truly the “Center of it All.” Most things of importance in southern West Virginia happen at the State Capitol or the Charleston Civic Center. The facility impacts the quality of life for citizens of our region by providing opportunities for them to be entertained, educated, and enlightened. The new facility will ensure these opportunities remain and allow the local economy to be further advanced by increasing the attraction of more meetings to Charleston. We invite our community to come visit this spectacular new facility. It will “knock your socks off.” The meeting and exhibition rooms and the technology incorporated in the facility is state of the art. It will make you proud that Charleston has such a magnificent new addition. City since it was built in 1958. Charleston leadership realized the space was in desperate need of improvements to continue being competitive in the convention marketplace. 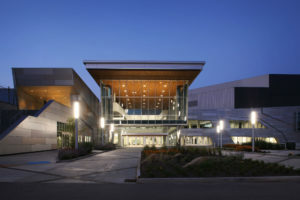 In 2015, BBL Carlton, ZMM Architects & Engineers and tvsdesign assembled a team of construction and design professionals that won the design-build competition for the civic center’s $100 million renovation, which was officially completed on October 19, 2018. Along with receiving massive upgrades, the iconic arena also received a new name—the Charleston Coliseum & Convention Center. “The new name more appropriately reflects what the facility is—a spectator arena for large entertainment events and a modern, state-of-the-art convention and meeting facility designed to service the meetings industry,” said General Manager John Robertson. The new name came on the heels of a brand-new look that extends to every corner of the building inside and out. 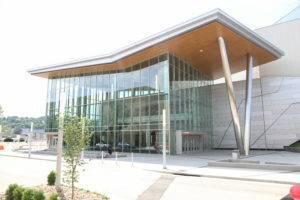 Along with a completely redesigned entrance and lobby, expanded and additional meeting space with high ceilings and a new ballroom, other interior upgrades include new carpet, tile and granite countertops; a catering kitchen; digital way-finding stations; functional public spaces; a refurbished exhibit space; loading docks; and WiFi access. The touch-screen way-finding stations present guests with a map of the facility and a list of what is happening and where. Each meeting room now has a digital screen outside the door that reveals what group has the room reserved, all of which is interconnected with the center’s booking software. The new catering kitchen offers back-of-house functionality to limit interruptions and is four times the size of the old kitchen. This modernized kitchen gives Distinctive Gourmet, the exclusive in-house caterer to the venue, the opportunity to showcase its talents at meetings, conferences and banquets of all types. All 25 meeting rooms are outfitted with state-of-the-art audio/ visual equipment, flexible meeting configurations, digital screens and LCD projectors or smart TVs. The physical upgrades also included an increase in overall wireless internet connectivity and availability. Leaders understood that in order to properly serve people attending events in this smartphone and social media driven era, the venue needed to dramatically increase its overall wireless scale and capacity.